Perhaps I am slightly biased when I say this, but the National D-Day Memorial has some of the best volunteers around. Not only are they a delight to work with and to learn from (since many of them know way more about WWII than I do), we absolutely could not do what we do without them. In just 2015, over 90 active volunteers contributed over 10,766 hours of recorded service time. Today, I am excited to share a blog post written by one of our volunteers. 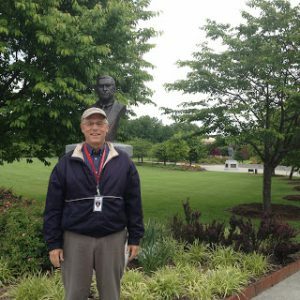 Richard Elder has been a volunteer at the National D-Day Memorial since March of 2013. He travels over 90 minutes to donate his time and knowledge as a tour guide every week.But, he also has a personal connection to D-Day as his father was one of the first men to land on Omaha Beach on June 6, 1944. Check out his post below. Captain Ned S. Elder, commander of Company C of the 743rdTank Battalion was one of the first Americans to land on Omaha Beach on 6 June, 1944. Captain Elder, a Reserve Officer, reported for duty as a First Lieutenant at Fort Knox, Kentucky in February, 1941 where he was assigned to the 69th Armored Regiment. By the summer of 1942, he became commander of Company C (Charlie Company) and led his Company through training for dessert warfare. 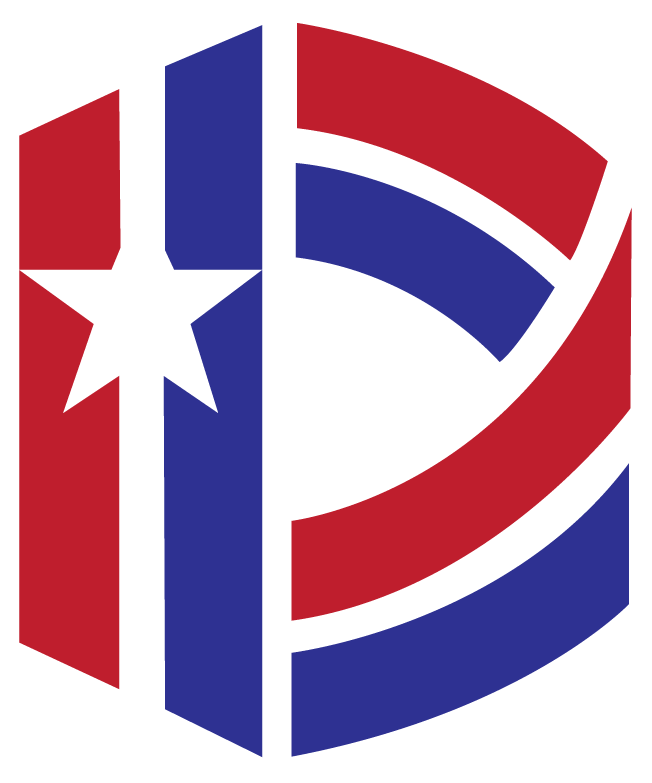 In November, 1943, the 743rd was transferred overseas to England for 5 months of Top Secret Training for its role as an assault company on Omaha Beach. 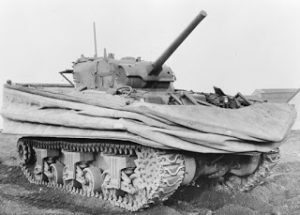 This Medium Tank Company was equipped with floating Sherman Tanks, commonly called DD Tanks, which were to be launched from LCT’s (Landing Craft Tank) out in the English Channel 4000 yards from the beach. A second drive, propelled the tank through the water as if it were a boat. Once on shore, these tanks were to array themselves along the water’s edge to provide artillery and machine gun support for the combat engineers and initial assault waves of infantry. According to the invasion landing plan, Charlie Company was to be the first American soldiers to land on the Dog White sector of Omaha Beach at H hour – 5 or 6:25 AM. Immediately to their right, Company B of the 743rd was to be the first to land on the Dog Green sector of Omaha Beach followed by landing craft carrying Company A, 116th Regiment (also known as The Bedford Boys). It is well documented that some of the fiercest fighting took place on these two sectors of the beach which accounts for the heavy losses incurred by The Bedford Boys. During the early hours of 6 June 1944, Captain Elder’s Company of 16 DD tanks was aboard 4 LCT’s afloat in the rough waters of the English Channel awaiting the moment for the run to the beach. At about that time, Captain Elder was faced with a difficult decision – whether to launch his 16 tanks from the LCT 4000 yards from the beach as planned, or to direct the LCT’s to carry his tanks directly to the beach. Captain Elder decided on the later course of action. This decision played an important role in the gaining of a foothold on the Coast of France. As a comparison, two Companies of DD Tanks on his left decided on the first of the two courses of action, resulting in the sinking of 20 of 22 DD Tanks in the rough waters of the English Channel. 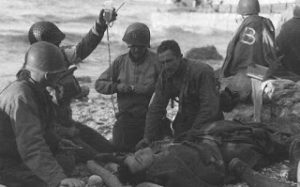 Lieutenant Robert M. Hodgson on Omaha Beach. Immediately upon landing his Company on Omaha Beach, Captain Elder directed the fire of his tanks against enemy pill boxes and strong points along the high bluffs of the beach. Shortly after landing, Captain Elder was wounded but refused to be evacuated. Despite intense enemy fire, he dismounted from his tank to select enemy targets and direct the fire of his Company. Due to the effectiveness of this fire, Captain Elder was eventually able to drive his tanks through the enemy lines and establish a vitally needed beach exit. For his actions on D Day, Captain Elder was awarded the Distinguished Service Cross and the Purple Heart. In the days following 6 June 1944, Captain Elder continued to lead his tank Company night and day. These actions included leading his tanks from the beaches to relieve the 2nd Ranger Battalion which had been surrounded by the enemy after their dramatic D-Day assault on Point De Hoc. Captain Elder was killed in action by enemy tank fire on 11 July, 1944 near St. Lo, France. 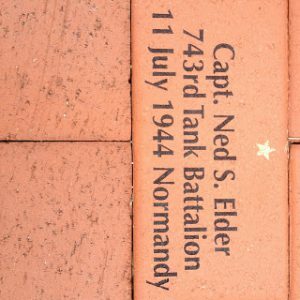 A brick honoring Captain Elder has been placed in the Gold Star Memorial Garden at the National D-Day Memorial. I've heard the bare details of the Ned Elder story from his granddaughter, Laurel. It was great to really get a sense of his role in D-Day. A great article. I'd like to make contact with Richard if possible as I spent time with Harry Hansen (Ned's second in command) and he spoke so endearingly of Ned. C Co 743rd led by Harry TB liberated our village on the 31 July 1944. Let me know how best to connect with Richard. He was at Normandy . He died of cancer in 1960 I was twelve my sister 2. We would like information as to were and what battles he was in please.